﻿Intelligent nanomaterials bridge the conventional concepts of "molecule" and "nano" in the bioimaging field. PHILADELPHIA — A novel, intelligent theranostic agent for precise tumor diagnosis and therapy has been developed that remains as small molecules while circulating in the bloodstream, can then self-assemble into larger nanostructures in the tumor, and be activated by the tumor microenvironment for therapy guided by photoacoustic imaging. The research was presented at the 2018 Annual Meeting of the Society of Nuclear Medicine and Molecular Imaging (SNMMI). 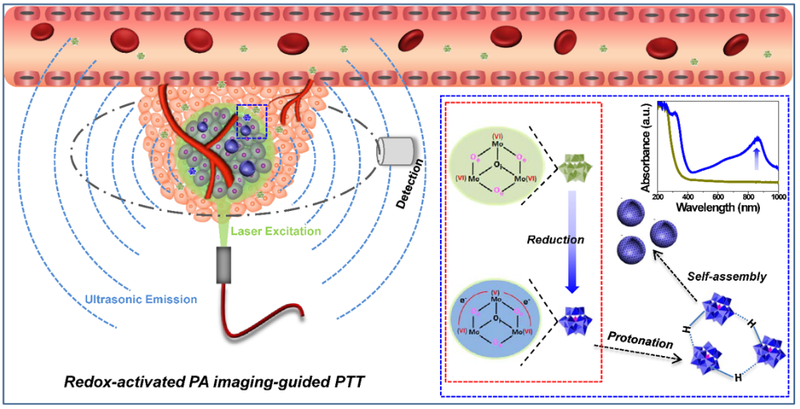 Tumor-bearing mice were tested with this novel system of redox-activated PA imaging-guided photothermal therapy (PTT). Redox is short for reduction–oxidation reaction. In this study, the ultra-small Ox-POM clusters accumulate in the tumor and are reduced in the tumor microenvironment. They then get protonated and self-assemble into much larger nanoparticles that are near-infrared (NIR) absorptive. Systematic in vitro and in vivo experiments were performed to evaluate their bioresponsive and theranostic capability. Results from positron emission tomography (PET) imaging with zirconium-89-labeled Ox-POM showed these clusters could escape from recognition by the liver and spleen and were mainly excreted through the kidneys, which is highly desirable for reducing potential toxic effects. Studies in the tumor-bearing mice showed that the PA signal was detected in the tumors as early as one hour post-injection. Under laser irradiation, the temperature of the tumor rapidly increased, reaching above 40 °C in 30 seconds and reaching 52 °C in five minutes; the tumor growth was eliminated without subsequent recurrence for a prolonged period of up to 2 months, whereas the control groups demonstrated rapid tumor growth. Abstract 188: “Redox-Activated Photoacoustic Imaging-Guided Photothermal Therapy with Bioresponsive Polyoxometalate Cluster,” Dalong NI, PhD, Dawei Jiang, PhD, Emily B. Ehlerding, Todd E. Barnhart, PhD, and Weibo Cai, PhD, University of Wisconsin - Madison, Madison, WI; Bo Yu, PhD, University of Wisconsin - Madison, Madison, WI, and School of Chemical Engineering and Pharmacy, Wuhan Institute of Technology, Wuhan, China; and Weijun Wei, Shanghai Jiao Tong University Affiliated Sixth People's Hospital, Shanghai, China. SNMMI 2018 Annual Meeting, June 23-26, 2018, Philadelphia.